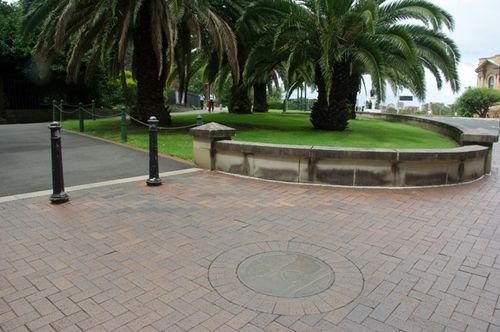 The plaque erected in 1979, was originally located in the Pioneers Memorial Garden, and commemorates the centenary of the opening of Sydney's first International Exhibition on the 17th September 1879 in the Garden Palace which was destroyed by fire in 1882. Bronze plaque, incised letters with line drawing of the Garden Palace. Built in the gardens close by for the 1879 Sydney International Exhibition, the Garden Palace was a spectacular sight. Its sudden destruction by fire in 1882 was equally spectacular.